It’s been a mixed season for Yorkshire County Cricket Club. Though there may have been emphatic wins in all three formats of the game, the rough has come with the smooth as a rain-ravaged season has dampened hopes of an historic third-consecutive County Championship title. And though many would say that Jason Gillespie’s side are strongest when competing in red-ball cricket, the Australian coach has been keen to increase the county’s fortunes in the the Royal London Cupay and the NatWest T20 Blast formats. Jonny Bairstow and Joe Root come off for tea after taking Yorkshire's total to 362-3 against Surrey on May 9. Picture: Bruce Rollinson. Losing the first three games of their Natwest T20 Blast campaign, before the fourth and fifth fixtures were abandoned due to rain, Yorkshire had to wait until round six before getting off the mark. That win came via the Duckworth Lewis method against Derbyshire Falcons at Headingley, but the crowd went home disappointed as yet more rain prevented an exhibition from England stars Joe Root and Jonny Bairstow. Switching to a more aggressive approach and winning five of their last six in the Blast, the Vikings are now on the verge of qualifying for the quarter-finals after having the slimmest of chances less than a fortnight ago. Sitting top of the North Group in the Royal London One Day Cup, Gillespie should be encouraged by Yorkshire’s form in the limited over game, as Alex Lees looks set to captain his side to the last eight in both formats. And with no runaway leader in the County Championship, Yorkshire remain hopeful of keeping their status as the Division One champions. However, with six teams battling for top-spot, it will be a stern challenge as unbeaten Middlesex are currently on course for a first title in 23 years. Yorkshire celebrate Steve Patterson taking Michael Richardson's wicket - one of six for the visitors' bowler - on June 20 at Chester-le-Street. Picture: Bruce Rollinson. While it really has been an all round team effort at Headingley this season with valuable contributions from all batsmen and bowlers, we look at six of the stand-out individual performances in 2016. WITH Adam Lyth hitting 111 on the opening day of the season, Jonny Bairstow went in overnight 107 not out. Not many would have expected Bairstow to come out the next day and strike the ball just as he did. In a memorable spell of batting either side of lunch from both Bairstow and Liam Plunkett, the pair put on 227 runs inside 29 overs. But it was the wicket-keeper who really excelled as both ended with career-best scores. At the crease for over six hours across two days, Bairstow hit 29 fours and three sixes scoring a whopping 246 runs off 270 balls. Having been reduced to 45-3, Yorkshire’s batsmen were under pressure. But with Joe Root and Jonny Bairstow at the crease, normality was restored. Sharing 372 runs in 67 overs, the two England players put on a real batting masterclass in the sun on the Monday. When Bairstow departed on 198, the stand was the highest ever for Yorkshire at Headingley and Yorks’ highest ever fourth wicket partnership. Coming out the next morning, Root moved from 190 to 213 before falling to Ravi Rampaul. Root spent 391 minutes at the crease and again impressed the following day, taking 2-23 runs off 12 overs. Though it’s the batsmen that have made the real statements this season, Steve Patterson produced with the ball just when it mattered. With Ryan Sidebottom, Jack Brooks, Liam Plunkett, David Willey and Adil Rashid all unavailable, Patterson couldn’t have picked a better time to claim his career-best figures. Bowling 20 overs and conceding 56 runs, Patterson ripped through the Durham attack taking six wickets as the hosts were 172 all out on day one. Yorkshire's David Willey pulls for four on his way to 74 against Northants Steelbacks in the T20 Blast at Headingley on July 22. Picture by Alex Whitehead/SWpix.com. Batsman Adam Lyth has arguably been the player of the season at Headingley this year. 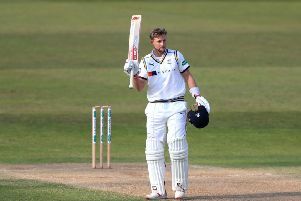 Scores of 136 against Lancashire in the Royal London Cup and 202 against Middlesex in the County Championship could have featured here, but the context of this knock gives it its place on the list. After previously disappointing in T20, the fixture was the turning point in the campaign. Opening the batting, Lyth hit a T20 career-best 87 off 54 balls as Yorkshire also scored their highest T20 total, 223-6, on route to winning by 49 runs. Not to be outdone by fellow opener Lyth, all-rounder David Willey posted his biggest score for Yorkshire in all formats of the game. Slamming five fours and six sixes against his old club, Willey hit 74 runs off 46 balls to provide the foundations for victory. With Alex Lees, Travis Head, Jack Leaning and Tim Bresnan all contributing, Yorkshire scored over 200 for the second time in three days. Willey then held two catches as the North Group leaders were 140 all out, allowing Yorkshire to keep their quarter-final aspirations intact. An afternoon that will live long in the memory for Yorkshire CCC, Travis Head and Jack Leaning. Making his debut in List-A cricket for the Vikings, Australian all-rounder Head scored 175 off 139 balls. Joined at the crease by fellow 22 year-old Jack Leaning, who hit 131 not out, the duo recorded Yorkshire’s biggest-ever partnership in one-day cricket as they put on 274 runs together. Finishing on 376-3, Yorkshire recorded their highest List A total against first-class county opposition. The visitors won by 191 runs as the hosts were 185 all out after 33.3 overs. Australian Travis Head scored a remarkable 175 off 139 balls for Yorkshire against Leicestershire at Grace Road in the Royal London Cup on July 24.